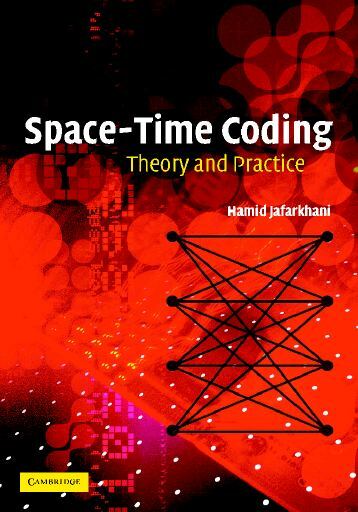 The book covers the fundamental principles of space-time coding for wireless communications over multiple-input multiple-output (MIMO) channels, and sets out practical coding methods for achieving the performance improvements predicted by the theory. Starting with background material on wireless communications and the capacity of MIMO channels, the book then reviews design criteria for space-time codes. A detailed treatment of the theory behind space-time block codes then leads on to an in-depth discussion of space-time trellis codes. The book continues with discussion of differential space-time modulation, BLAST, linear dispersion codes and algebraic codes. The final chapter briefly addresses additional topics in space-time coding, like MIMO-OFDM, space-time turbo codes, and combining beamforming and space-time coding. The theory and practice sections can be used independently of each other. The book is ideal for a graduate student familiar with the basics of digital communications, and for engineers implementing the theory in real systems. The book has been translated and published in Chinese.